Junior doctors' leaders are trying to bring down the government, a government source has told the BBC. In a scathing attack, the source said the two all-out strikes this week were aimed at toppling the government and Health Secretary Jeremy Hunt. The British Medical Association said the accusation was "ridiculous". It comes as medical leaders called on the prime minister to end the stand-off, warning it posed a "significant threat to our whole health system". Thirteen senior organisations, including the leaders of 10 royal colleges, have written to David Cameron saying it is up to him to intervene to bring both sides back to the negotiating table. The letter said: "The ongoing impasse in the dispute between the government and junior doctors poses a significant threat to our whole healthcare system by demoralising a group of staff on whom the future of the NHS depends". Will all-out strikes be Armageddon? Was a deal with doctors ever possible? The royal colleges told the BBC the onus was on the government in power to come up with a solution - and to do that it needed to halt the imposition of the new contract, which has prompted the BMA to escalate the strike action. But on Monday, a government source ruled out any compromise. The source told the BBC BMA leaders had radicalised a "generation of junior doctors". And if the government backed down, it would face similar industrial action by other unions, which were watching this dispute "like a hawk". Junior doctors will walk out from 08:00 BST to 17:00 BST on Tuesday and Wednesday. This stoppage will see doctors stop providing emergency care for the first time in this dispute - and ever in the history of the NHS. The previous strikes have all involved cover being provided. Instead, it will be left to consultants and middle-grade doctors to staff intensive care, accident and emergency and maternity units, along with nurses, midwives and other non-medical staff. Hospitals have been putting contingency plans in place, including the postponement of more than 100,000 appointments and nearly 13,000 operations. Extra GP appointments are being kept free for urgent appointments. Earlier on Monday, Health Secretary Jeremy Hunt described the strikes as "extreme" and warned they would be "deeply worrying for patients" and could end up risking safety. 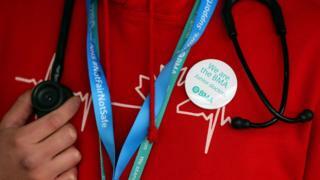 But BMA leader Dr Mark Porter said the government had the power to stop the industrial action. "If you agree to lift imposition while talks resume, we will immediately call off the industrial action," he said.